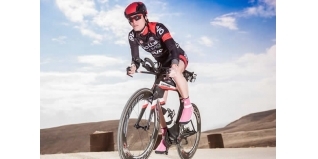 British long distance Pro Alice Hector (www.alicetri.com) has had arguably her best season to date in 2016, including winning her first Ironman 70.3 title in Reugen, Germany. Day 1: Wednesday. T minus 3 days. After a smooth but full flight (where luckily and quite by chance, I got seated beside fellow GB pro Natalie Seymour), I was at the hotel by just after midnight and asleep by 2 am. Oh well - I guess I was excited, and definitely still on UK time. I awoke late; confused and alone in a foreign land. My partner and one-man paparazzi crew Darren (thatcameraman.com) isn't due to get here until late Thursday and he loves strategy and planning. For me, one could say that is not my forte. It was a day of finding my feet. It's just a shame my feet seem to take twice as long to find as other people's. No stress. I'm used to it by now! I found my way to the race resort eventually. It's only 1.5k away but I took the wrong road and ended up cycling through 'downtown' Bahrain. Interesting. Not wholly recommended as it was largely gridlocked with vociferous vehicles, but the locals are probably not used to strange ladies/foolish buffoons on fast bicycles, so rather than mow me down in their cars London-style, I think I surprised them enough into being quite accommodating. A 30 min swim in the hotel pool (10 metres long - 6 strokes - you make the best of it) and rolling around on a rounders ball (release-work) filled the rest of my day.